Galway's Conor Cooney and Waterford's Tadhg de Búrca. THEY WERE THE last two standing in the hurling journey of 2017 but are enduring contrasting fortunes as they set out on the provincial routes in 2018. The reigning champions Galway have not put a foot wrong in Leinster in picking up two wins, notably issuing a statement with the manner of their success on home soil against Kilkenny last Sunday. The beaten finalists Waterford have stumbled at the start in Munster against Clare and suffered such a ruinous streak of injuries that it threatens to throw their summer plans into disarray. There is a stark difference between the current outlook facing Micheál Donoghue and Derek McGrath. This weekend could be telling as they face their latest assignments. For Galway, they can guarantee a safe passage back to the Leinster final with a win in the south-east tonight against Wexford. For Waterford, a meaningful result is needed against Tipperary at the Gaelic Grounds tomorrow to reignite their Munster campaign. In the eyes of Kilkenny’s serial All-Ireland winner Michael Fennelly, last Sunday was instructive in assessing Galway. A strong collective and decent form places the reigning Liam MacCarthy Cup holders in a good place. “We were all kind of wondering where Kilkenny were. The one we were looking forward to was the Galway game, just really see where the lads were at. After the game it’s realistic to where they actually are at in terms of development. “Galway look like they’re after picking up where they left off last September. Most of those players are now five, six years on the panel and they’ve been with each other a good few years at this stage. It hasn’t changed dramatically. That team is quite solid the last number of years. “Galway have been competitive and very close and obviously they got over the line last year. They look comfortable enough. They’ve really strengthened up the centre with McInerney and Daithi Burke, that’s been there for a while. (Padraig) Mannion seems very settled out half-back, they’ve all quality backs. They’re in a good position. “I’d say definitely Micheál Donoghue is pretty happy. It’s early to a degree but this thing will be done and dusted quickly, everyone knows these four or five games in the provinces are coming quite fast. Fennelly can empathise with the plight Waterford face. His own career was marred by injuries, more recently when he ruptured his Achilles tendon in the 2016 All-Ireland semi-final replay against Waterford. “Their team has been decimated really to be honest. That’s a huge blow to them. You’d wonder what’s left for Waterford this year to be honest? “I know myself last year, we’d injuries, there was eight of us in the stand at one stage during the league and we struggled for most of the year. There was repeat injuries occurring for some players. We never really had a full team throughout the whole year and Waterford’s situation is probably ten times worse than where we were at. “Missing one or two is a lot, but seven or eight, mother of God I couldn’t believe it. Your heart actually goes out to them but all they can do is stay positive and give what they have until the year is over. “It’s been pure unlucky in one sense. Even to have seven or eight around this time of year is an awful lot. With the course of the Munster championship usually, you’d have a couple of weeks to pull back a couple of players but unfortunately for them with the new structure, they don’t have that luck. 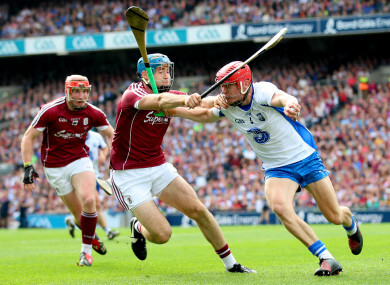 Galway are hoping to remain flying high, Waterford are in need of a lift. This weekend’s encounters will inform a little bit more. Michael Fennelly in action for Ballyhale Shamrocks. Michael Fennelly’s club Ballyhale Shamrocks, the six-time All-Ireland senior champions, are holding a ‘Hurling with the Stars’ fundraiser on 21 July. On this day a winning club’s hurling team will coached and mentored by some of Ballyhale’s most illustrious figures like Henry Shefflin, the Fennelly brothers, TJ Reid and James ‘Cha’ Fitzpatrick. To enter the draw, which takes place on 25 June, see www.hurlingwiththestars.com for further information. Email “'Missing one or two is a lot, but seven or eight, mother of God I couldn't believe it'”. Feedback on “'Missing one or two is a lot, but seven or eight, mother of God I couldn't believe it'”.